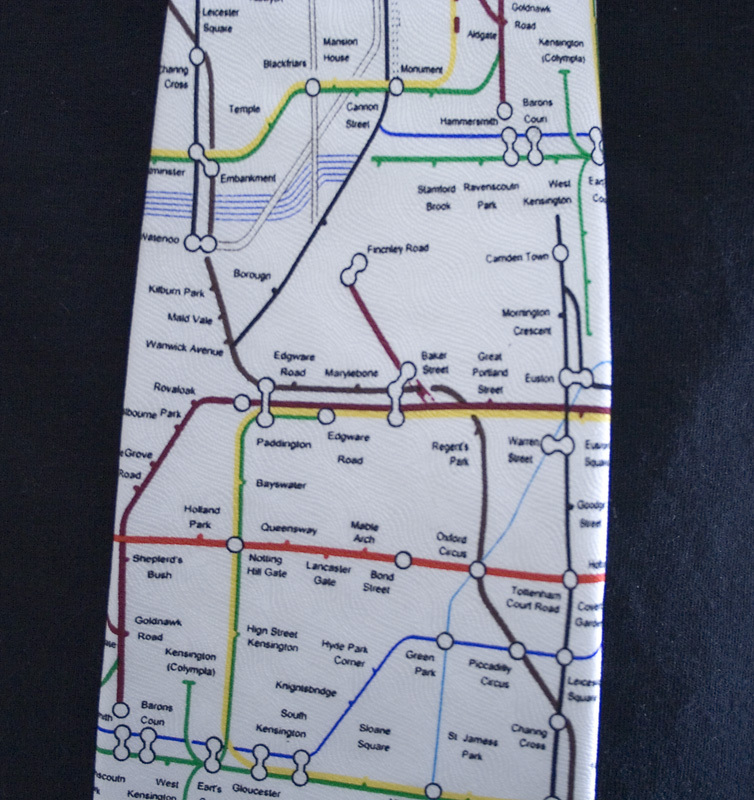 Some of you may remember the Tube Map pencil case quiz where you had to spot the mistakes with the map. So the same goes here. 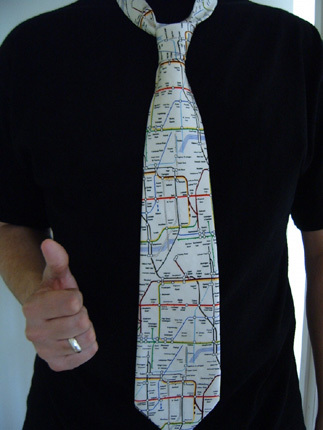 Click on the picture of the enlargement of the tie below and you have to spot what's wrong with it. Bearing in mind it's unofficial there's likely to be a number of things. For this quiz, one guess only please, and each guess must be different. Please make your guesses by Sunday 7th May 23.59 GMT. All of the correct entries will go into Neil's paper clip selection and he'll select two people who'll each receive a tie. To enter leave your email address and/or website/blog with your answer in the comments below. 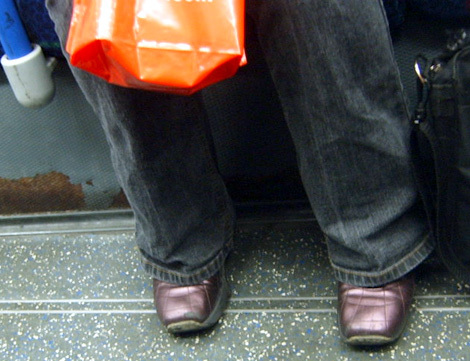 Here's the weekly look at commuters who are slaves to fashion or have a particular fashion taste that caught my eye. The focus is on footwear this week. Although there is a touch of red in her shoes so perhaps that's why she wore pink tights. With apologies to Amy Winehouse who sings about her "F**k Me Pumps", you know the type of shoes a woman might wear when she's on the pull. You have to admire the daring shade of red and the killer pointy toes, but I think the effect is spoiled buy the strange fringy stuff on the top. 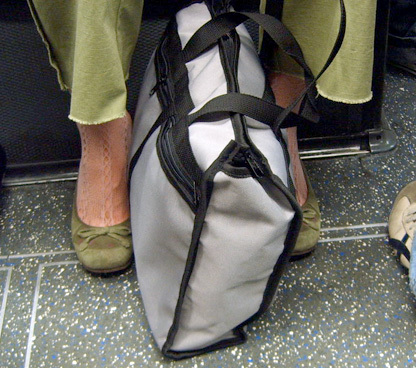 Regular readers know my views on Metallic bags and just when you thought it couldn't get worse, two spottings of Metallic Trainers. 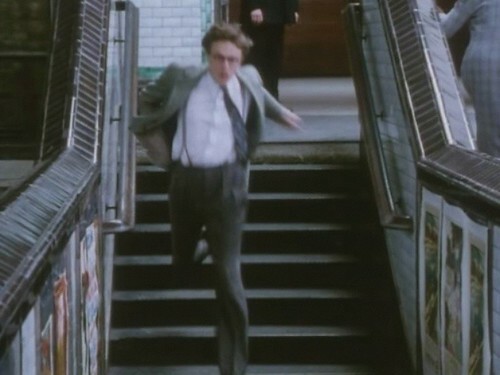 Many thanks to Rob from Londonist for sending me a link to the fab subway song by the Muppets. Think of it as a Muppet version of the Going Underground Spoof Song, but with a dance routine at the end. I love the "Broadway" musical feel it has to it, plus some of the lines are brill. "Cos there isn't any room in this town, we put all the trains down under the ground" "Packed inside the train it's too crowded to complain on the Subway! Subway!" "Ahhhhhhh my stop just went by. Ahhhhhh your umbrella's in my eye. Ahhhhhh It's so hot I could die". "You can lose your purse or you might lose something worse on the subway! Subway!" "Come and step inside, you'll get taken for a ride on the subway! Subway!" Enjoy. You might be humming the tune for the rest of the day though! Finally, happy Bank Holiday weekend if you're in Europe. As part of the huge "improvements" taking place to the much of the London Underground at the moment, from this weekend and for the next ten weekends, the Charing Cross branch of the Northern Line will be closed between Camden Town and Kennington. And there will be a reduced service on the remainder of the line. The thing is with the Northern Line "a reduced service" will be close to meaning "no service" as it's so rubbish anyway. It's quite scary to imagine what a reduction to the service will be. 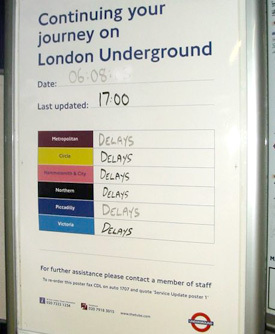 George McNulty, a service director for London Underground, and master of understatement said "We recognise that the Northern line's performance is not as we would like," You don't say George. He continued, "but we are looking forward to Tube Lines taking this opportunity to accelerate the amount of track renewal work undertaken." Anyway Transport for London seem confident that they won't have loads of confused tourist wandering around throughout May, June and half of July. Because "All the stations on this part of the Northern line either interchange with another line, which will be running on those weekends, or they are a bus ride away, or within walking distance of another Tube station, so no rail replacement buses will be provided." Security Alert was an "art installation"
I've just found out why I was 50 minutes late for work this morning. I got stuck at Turnham Green on the Sadistic (sorry, District) Line, as there was a security alert at Glamoursmith (sorry, Hammersmith) and the District and Piccadilly lines were suspended. So I walked to Hammersmith hoping to pick up a Hammersmith & City Line train. But this was also suspended and police were everywhere around Hammersmith Circus. I managed to squeeze onto one of the crowded buses heading towards Shepherd's Bush, only when I arrived I found out that there were loads of fire engines and police swarming around Shepherd's Bush Green too. 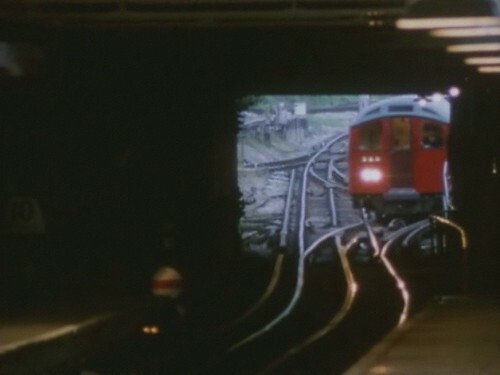 Fortunately the Central Line was open, so I was able to get onto to that and get into the West End. A number of my colleagues from West London had the same problem and when I was moaning about it today, I heard that the security alert was because a woman had left around fake bombs as part of an "art installation". 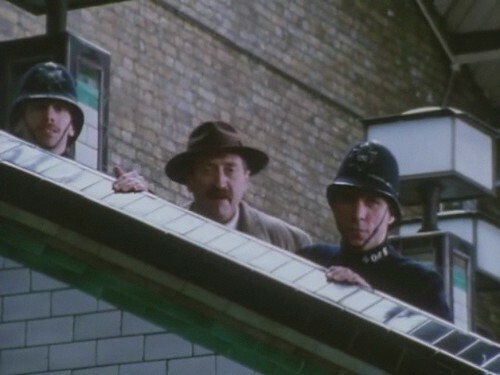 "The woman who is from the Shepherd's Bush area and who described herself as an artist was then arrested on suspicion of causing a public nuisance and taken into custody where she remains." I can think of many other ways that I would like to describe her and artist isn't top of the list. Rob from Londonist got back from his honeymoon in Singapore and Hong Kong last week and kindly sent me some videos of the underground system there. The one from Hong Kong is great. Look out for some nice details including a commuter wearing one of those white masks to either stop them giving their lurgies to other people or vice versa, or just to generally protect them from pollution. "1) Dozens of delicate paper butterflies hanging from the ceiling - how long would these last on the London Tube? 2) You should just be able to make out the threat of a 6000 dollar fine and 6 months imprisonment for something on the electronic sign on the platform. 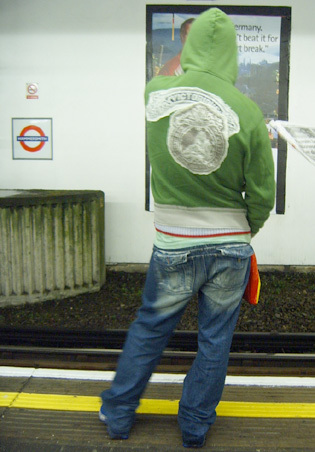 3) The lack of any 'let passengers off the train first' etiquette. HK is incredibly polite and ordered but they don't have the 'let them off first' rule and neither do they have the 'stand to the right of the escalator' rule. Are they mad? 4) The cool video ads playing on the platform. 5) The very helpful 'fairy light' tube maps which tell you right away which direction you're going and what stop's next. Also (difficult to make out on the video) is a light telling you which side of the carriage the doors are going to open on at the next station." He also wants to know if anyone can tell us what the bouncy LCD sign at the end says? The video from Singapore's underground system is here (interesting how they have TV monitors showing films/advertsing in the carriages) and Rob also found a cute little poster from a series of "Graciousness is...." ads on Singapore's network. They reminded me of the old London Underground "Love Is....." series of posters. I wonder if they got the idea from London? Cheers Rob, the picture & videos rock! 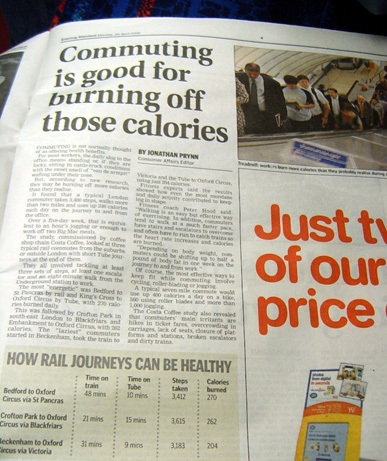 Yesterday's Evening Standard had an interesting feature about how much weight you can lose in your normal commute. Which is quite handy as I still need to lose the pounds I put on over Christmas! It said "For most workers the daily slog to the office means standing or if they are lucky sitting in cattle truck conditions with the sweet smell of eau de armpit wafting under their nose." But research carried out by Costa Coffee (of all people) means we might be burning off more calories than we think. "A typical London commuter takes 3,400 steps, walks more than two miles and uses up 246 calories each day on the journey to and from work". Over a five day week that's apparently the equivalent of an hour's jogging or burning off two Big Mac meals. The survey looked at three typical rail commutes but also added short Tube journeys at the end of them. This meant three sets of steps, at least one escalator (did they count walking up the escalator though?) and an eight minute walk from the Underground to work. 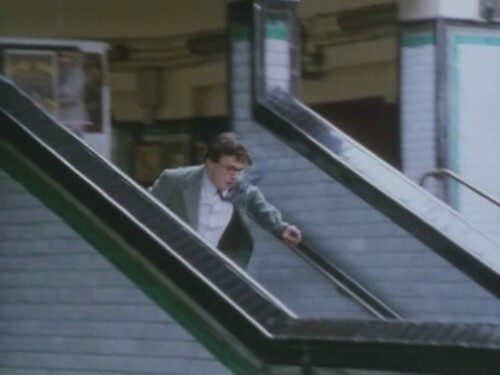 They got in a a fitness expert to try to verify their theory, who rather obviously said "Commuters tend to walk at a much faster pace, have stairs and escalators to overcome and often have to run to catch trains so the heart rate increases and calories are burned." Peter Hood continued "Depending on body weight, commuters could be shifting up to half a pound of body fat in oune week on the journey to or from work". I suppose if you add sweating like a pig in over crowded carriages in the summer time, dealing with the numerous escalator closures so that you have to hike up the stairs and calories lost by the chocolate machines having a melt down, which should be thanking the London Underground for providing such a health conscious service! 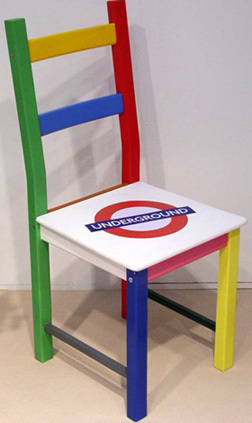 Thanks to Susan for sending me a link to a London Underground chair which is being auctioned to raise funds for Leukaemia Research. The auction ends on the 28th April. It's based on an Ikea pine chair and I've just spent a small fortune in Ikea and gave myself a massive headache by putting up half a desk (why Ikea don't put even a few written instructions in their flat packs is beyond me - as their illustrations aren't particularly foolproof). Being an Ikea chair, I'm surprised it hasn't been given a name like Billy (my bookcases), or Johan (my new desk). If I win it, I'll call it Fairlop as that sounds suitably Ikea-ish! Or perhaps it should be Neasden as it's the nearest Tube station to Ikea. Here's The Friday Fashion Victims on Saturday (moving house meant eveything's skew whiff). So it's the weekly look at commuters who are slaves to fashion or people who are taking a "trendy" style and "making it their own" regardless of whether it suits them or not. Finally I have a man to redress the imbalance of women over the past weeks. 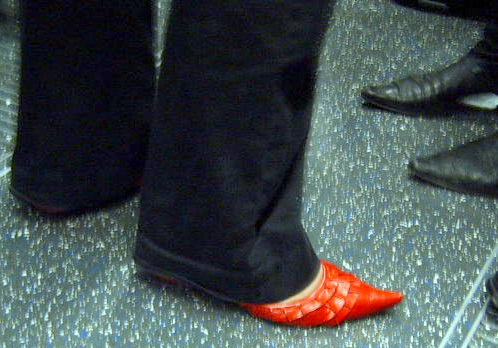 I know women who do this, and if I were them, I think I'd just buy a pair of smart work shoes that I could easily hop around the Tube on. But I spose having a pair of heels in your bag might come in handy if you ever need to swing your bag someone. 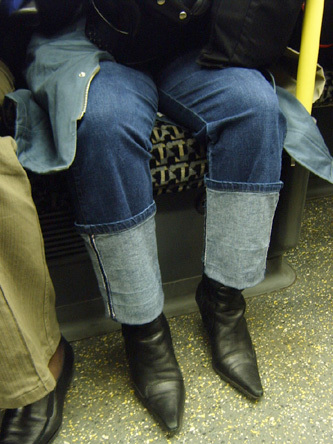 Is it just me or are some people trying to get their jean turnups to take up half their legs? Pink Uggs with an anorak. Or rather Pink Uggs with anything. The mind boggles! Friday's quiz on Thursday (I'm moving house, up to my eyeballs in boxes & will only have sporadic internet access over the next day or so). 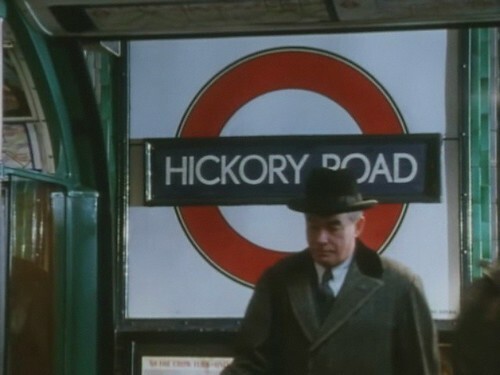 A few weeks ago, me and Neil were watching an old episode of Agatha Christie's Poirot called "Hickory Dickory Dock" & much of it was based around a Tube station called "Hickory Road". However, we still couldn't actually work out where it was filmed. It's obviously a station that was around in the 1920's or 1930's when the story was based. 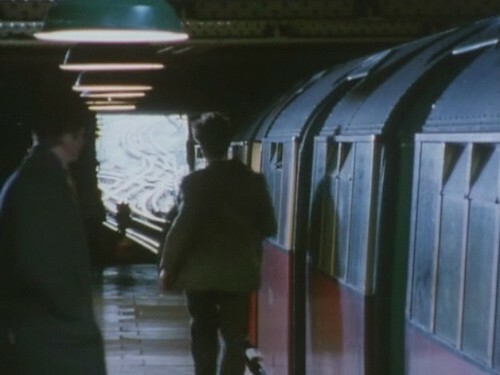 The outside shots looked like they could have been a set, but the ones inside definitely looked like a real Tube station. I asked another contributor who was likely to know and he came up with an excellent suggestion. Neil checked it out on Monday and took a shot of the lines from the station in question. So can you also work out where it is? This time, one guess only please and as usual to enter, leave either your email address and/or website or blog in the comments below. You have until 23.59 on Sunday 30th April to enter. In the event of more than one person guessing the correct answer, Neil's paperclip selection will come into play. 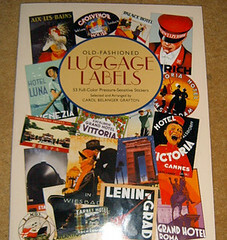 The prize is a book of 53 "Old Fashioned Luggage Labels" stickers. They remind me of the fab art deco opening titles to Poirot, which always want to make me travel on the Orient Express. 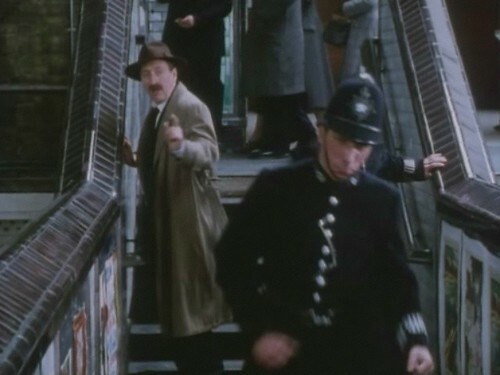 There's also a bonus prize if you can come up with a caption for what Damian Lewis (pictured above) from the same episode of Poirot, is saying to his lady friend on the Tube to make her laugh. The funniest caption will win this rather unsual photo frame / fridge magnet in the style of the ticket booths that were around at the time. Same deadline of the 30th April, but the more the merrier with caption guesses. A few weeks ago Phill Price sent me a picture of the white haired guy below, who is famous and asked me to guess who he was. I guessed fairly quickly cos I'm a bit of a tube celebrity stalker. Do you know who he is? No prizes, just the satisfaction of knowing you're right! 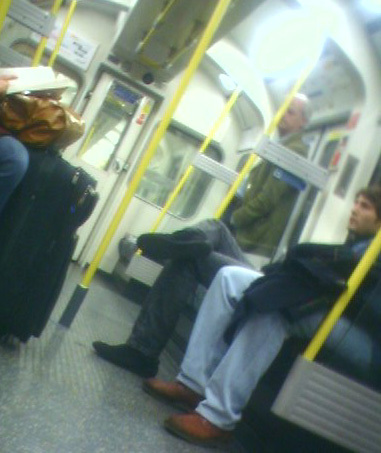 There must be quite a few people who travel on the London Underground who just happen to look like celebrities and have people staring at them or people like me try to take pictures of them. Have you seen any celebrities or people who look like celebs recently? You may remember that a few weeks ago we had a reunion with Tami Brisset, the New Orleans Police Captain who came over in August to take part in Tube Relief and then ended up being stranded here while Hurricane Katrina was wrecking havoc to her home. It's extremely generous of Tami as she already gave us all a load of Mardi Gras beads when she was over. 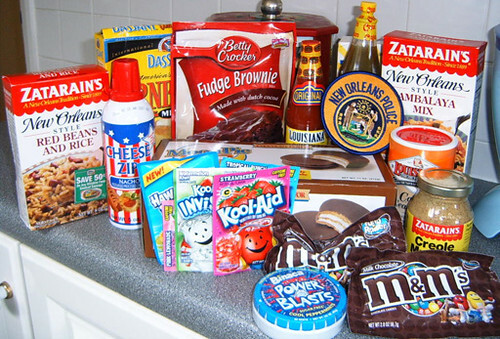 I must think of a suitable food related quiz so that I can share some of this. But in the meantime, thanks so much Tami, it's really appreciated! Sam Cawley (pictured on the far right) who was also came to the Tube Relief Reunion and individually raised the most money for the event, has a non Tube plea, which any football fan might be interested in. Plus something for cricket fans - 2 Hampshire cricket tickets, valid for any Totesport league or Cheltenham and Gloucester trophy, but not floodlit! If you would like to bid on any, please email her on sam.cawley@btinternet.com. Many thanks, and watch this space for a food/London Underground related quiz for a share of the hamper! "Can't speak, I'm going into a tunnel"
Well it looks like we might not be hearing that any more from the summer of 2008 as the London Underground is going ahead with plans to have mobile phone transmitters in Tube, in spite of initial fears by the Lib Dems that the transmitters might provide a new way to detonate bombs. According to the BBC, the political party "have been persuaded that any extra risk is minimal and that in an emergency, people need their phones. A study looking at putting transmitters in four stations begins this month. The two-month feasibility study will look at the space, power and changes needed to put mobile phone masts in stations." The project, to put transmitters which would also allow internet access and WiFi hot spots, was put on hold after the July 7th bombings. In Spain, investigations revealed that the Madrid bombers, while using mobile phones as detonators, set off the bombs by using the phone's alarm function rather than by calling each individual phone. A spokeswoman from London Underground said "The timers of mobile phones are not affected by whether a signal can be received or not so the Tube would not be at a greater risk from that type of attack than it is now". Lib Dem MP and former London Assembly Chair of Transport Policy, Lynne Featherstone, conceded that "Better communications could be of enormous benefit in the event of an emergency, allowing passengers to communicate with the emergency services and worried relatives". But we will still have a fairly peaceful "haven" where people aren't shouting into their phones, above the racket of being in deep level stations, for a year or so. The Tube's spokeswoman said: "It is our intention to commence a trial at a small number of Tube stations in late 2007 with the aim of introducing mobile phone and new technology provision at stations from summer 2008." For the full story check out BBC News. 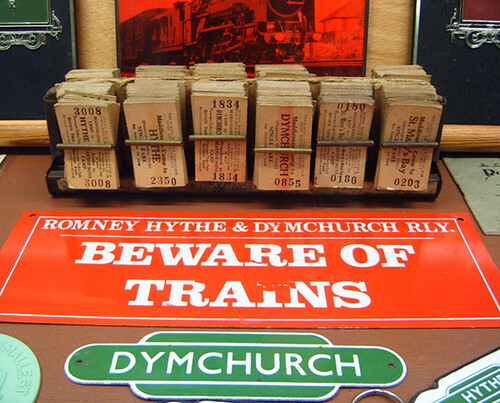 Just a mini break from the London Underground, as me and Neil were on a mini Easter break to Kent to see the Romney, Hythe & Dymchurch Railway, the world's smallest public railway. I had actually been on it before, but it was Neil's birthday on Saturday so I treated him to the delights of the world's smallest public steam railway. 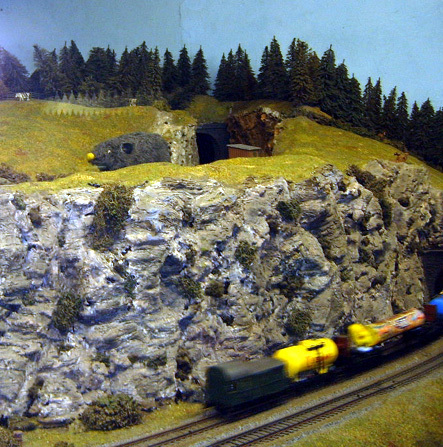 The other great thing about the model railway exhibition there were the rather bizarre juxtaposition of things in the scenery alongside the trains. Every so often you'd hear someone say, "Oh look there's a dalek", or "Look at the dinosaurs", or my favourite "Look at the rat"! 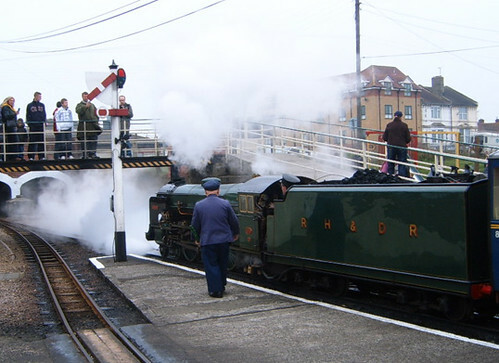 We took the railway for the 13 and half miles from Hythe to Dungeness, stopping off at New Romney on the way, for lunch and a visit to the Model Railway Exhibition. Dungeness is probably one of the worst places to visit in Kent. By the railway it is totally flat and deserted and the only things that break the bleak landscape are occasional spots of yellow gorse bush, two pretty uninspiring looking lighthouses and the splendour that is Dungeness power station. It was pelting with rain by the time we reached there, which was fortunate as it meant it didn't take long for me to convince Neil to stay on the train and loop straight back towards Hythe. There's something typically "English" about seaside towns in the rain and although all of the stations ran along the coast line you can't actually see the sea properly from the trains. You get glimpses of it from Romney Sands (sounds much nicer than it is - basically the land of caravans and grim 'holiday homes') and perhaps if it wasn't so grey and wet from Dungeness, we might have caught a glimpse of it then. 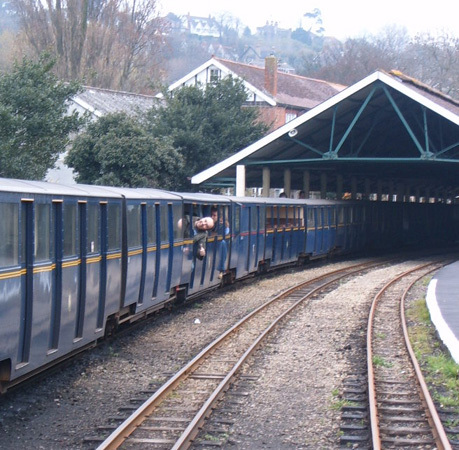 However, we actually had a good laugh, you can see Neil giving the train a "thumbs up" when we left Hythe. There was also a suitably London Underground style announcement apologising for the late running of the train into New Romney, just so that we felt at home! I'm sure Neil will update his blog with his version of the day and hopefully more photos than me. 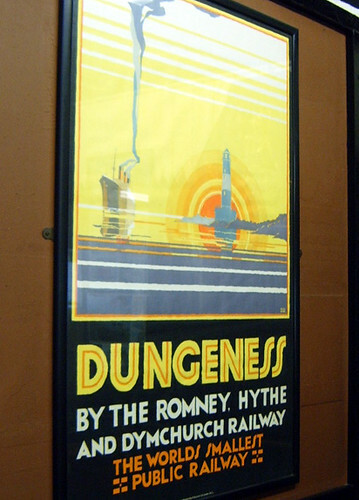 He took quite a lot of the marshy wet Dungeness (apparently a great place to bird-watch - so it does have its benefits) and you'll be able to see how different it looks from the sunny "Welcome to Dungeness" poster from the Model Railway Exhibition. 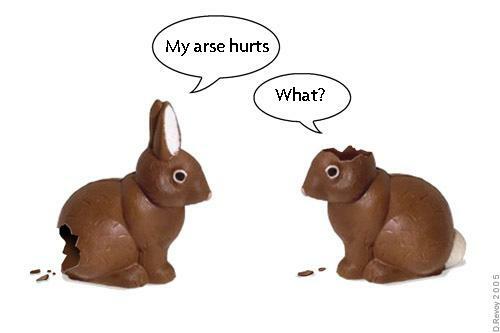 Happy Easter and cheers to my colleague, Wozza, for sending me the picture! "So, How was your journey?" Just got in from a leaving party at work, (Bon Voyage Alick, you'll be missed), and after staring rather hazily at a cross platform ad at Leicester Square, I thought, "Crikey this is one of the reasons why I began GoingUnderground in the first place". The ad focusses on one of those days when you are stuffed in the Tube with your face in somone's armpit and you feel the need to really moan about your journey, when someone asks how it was. In the New Year of 1999, I thought that I fancied building a website, but wanted one where I could wax lyrical about something I felt other people might want to wax lyrical about too. The Tube seemed the obvious thing to me, as I can't remember the amount of conversations I've had over the years with people saying "You would not believe the journey I had into work today". At the leaving party, a number of us were talking about those "old" sites like Fortunecity, where you could build a site for nothing, and they were all in "streets" roughly divided into categories - Goingunderground still exists in some rarely updated shape and form at http://www.fortunecity.com/victorian/finsbury/254/ (beware the horrible pop ups), and I think I chose victorian as a place to house my site because of the Victorian nature of the Tube and I think Finsbury meant that it was a UK related or a London related site. Christ knows now, to be honest, but I've got a lot to thank Fortunecity for, even though I now pay for my hosting of goingunderground elsewhere. Anyway, yesterday morning, I really felt like the woman in the ad above, as the Northern Line was acting as normal, meaning there were long delays between each train and even though it was 9.50am during a holiday week, I was on a crowded train with no prospect of a seat. Even the female breakfast show presenter on Heart FM (Harriet Scott) had been moaning about the Northern Line like mad and saying how she now walks extra stops rather than put up with it. Apparently it's even harder to sell your house or flat if it's on the Northern Line route, so it's not called The Misery Line for nothing. My sympathies to all fellow Northern Line passengers and woe betide the person who asks us how our journey was. Incidentally, how was your journey today? 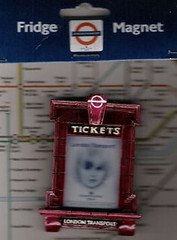 I must thank all of you who entered Fimb's excellent London Underground scavenger hunt quiz. The answers were so imaginative that Fimb and myself felt compelled to give some bonus prizes of fridge magnet calenders or London Underground lapel badges to the most creative answers too. 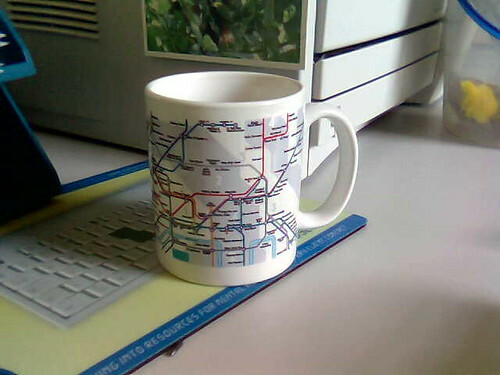 Soooooo, Neil had to do his paper clip selection and the winner of the London Underground Anagram Map Mug is Jo. So well done to Jo who has won the "banned" limited edition mug above. Onto the most creative answers - Jo's fab link for the picture of a celebrity on the London Underground (Jodie Marsh dressed as a chicken on the Tube) was ingenious, so not only does she win, but she also gets a bonus prize too!. John B gets a prize for giving us a painting of Blur for the best celebrity (or celebrities found on the Tube), Jon Justice gets a prize for going to the trouble of making some images for the quiz - I particularly liked his Tube train you can eat picture, Dmitri for his inventive Tube related tattoo and Lewis's Tube train swiss roll also deserve bonus prizes. So well done to all the winners and to everyone who entered into the spirit of the quiz. How many London Underground Stations have alliterative names? 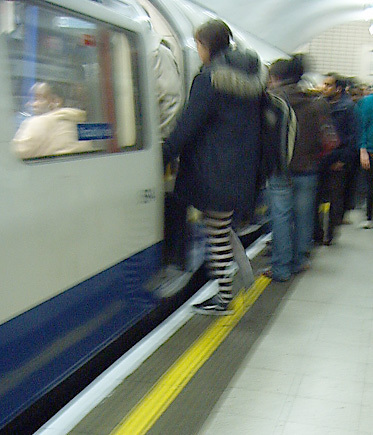 "I recently got asked the following question (indirectly) on my blog: "How many London Underground stations are alliterative?" The question was indirect because the reader entered it into a search engine to get to my blog. I was wondering if you could help us answer the question?" Surprisingly I don't think there are actually that many - Seven Sisters, Charing Cross, Clapham Common and Golders Green were the only ones I could come up with, and Hampstead Heath (although as it's on the North London Line, I don't think it really counts). But perhaps I'm missing some. I much prefer even more unique station names, such as the only two stations which have every vowel in them and the only station that has none of the letters from the word mackeral in it. 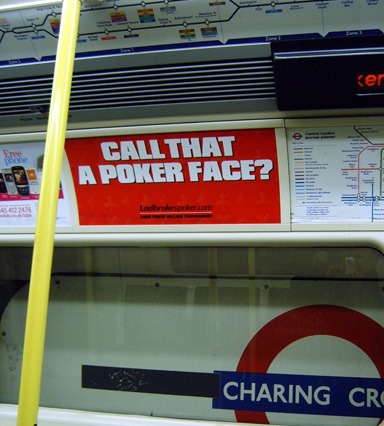 Do you have a poker face on the Tube? The Sunday Times had an article about the rise and rise of game shows this weekend, and said that TV is having to catch up with the internet with dumbed down games - hence the launch of ITVPlay channel next week. "Gaming on the internet is growing, and people have become accustomed to the idea of pursuing a solitary obsession through a relationship with a machine." I have a bit of a poker face on the Tube, specially when taking pictures of people sitting opposite me. 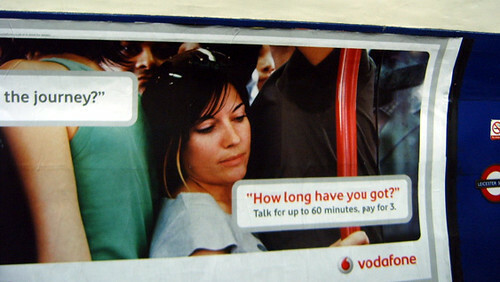 But in general I think, the advertisers have got a point here, as most commuters have pretty good poker faces. 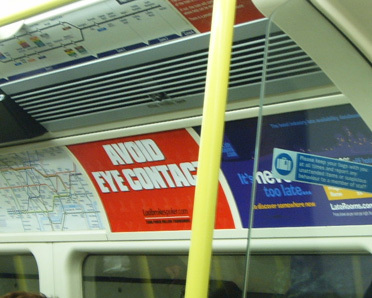 We all generally avoid eye contact and turn off our personality on the Tube. If we haven't got anything to read, we try to put on that vacant air to show that we're not really thinking about much at all, and that we're certainly not imagining what the person sitting opposite us does for a living, or what they might be having for tea that night, or what they've just had for breakfast. Even if we do have such thoughts, they usually leave us the minute we get off the Tube and we go on with our real life overground. And we certainly don't think that they might be having exactly the same thoughts about us. Or do we? How many times have you imagined a life or story for the person sitting opposite you, or does the Tube "Poker Face" get in the way? 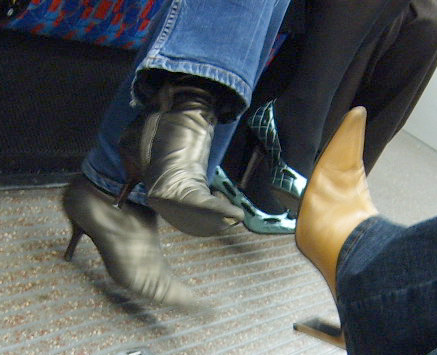 Yet another survey on commuter habits has "revealed" our pet hates when travelling on public transport. According to Mobizines, the "top five most hated behaviours are - bad body odour or breaking wind, loud telephone conversations, loud music, getting angry and kissing." 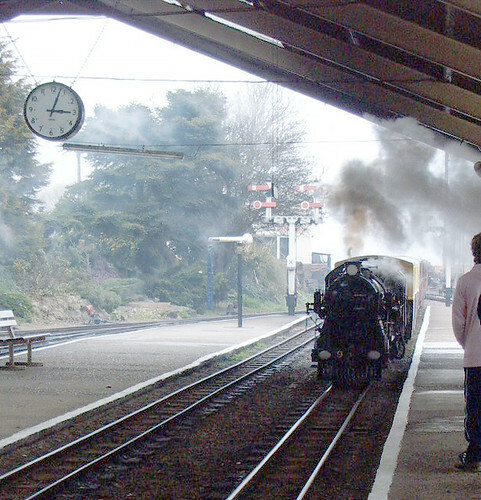 The press release continues "Rather than complaining about late-running trains, one in three commuters (33%) cited catching a whiff of body odour or someone breaking wind as their pet hate when travelling to work. In fact, music from personal music players (16%), loud telephone conversations (26%) and public displays of affection (5%) were cited as being among the habits that fuel commuter rage rather than service disruptions." 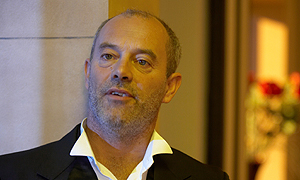 As the man behind Mobizine, Scott Beaumont, says "Jean-Paul Sartre famously wrote that 'hell is other people' and our research proves him right. With passenger numbers set to increase by 30% over the next 20 years and no plans by the government to increase capacity, commuter patience is set to be tested to the breaking point." The research seems to show that rather than us being more annoyed about the delays and poor service we're more worried about fellow commuters. Only 15% of people said that they got stressed out by overcrowding, accidents and delays to public transport. However, it looks like we just grin and bear bad habits, as only 3% admit to asking people to stop their irritating behaviour. But if the annoying behaviour is just being smelly, farting, and snogging, I spose it's hardly stuff that we can say "Please stop" to. Sadly for Mobizine - reading over people's shoulders didn't seem to come out as highly as an annoyance with commuting as they probably hoped. The company could only make the following comment to help promote their mobile magazine downloading tool "Having something interesting to read while travelling helps take our minds of crowded conditions and people's antisocial habits. 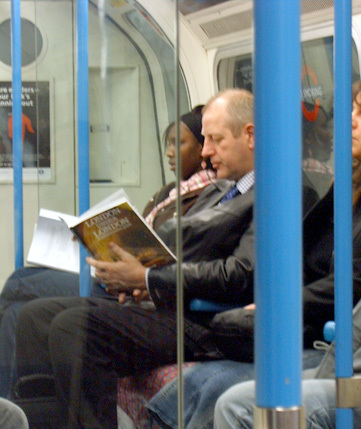 Unfortunately public transport is often so full, you can't even read a book, let alone a paper. With Mobizines, it's the first time commuters can download 'snack sized' versions of their favourite magazines in a rich, colourful format to their mobiles, perfect to read even in crowded spaces." I wouldn't say that smelly people on the Tube is my biggest worry, but with air conditioning on the London Underground supposedly being impossible and with experiments like Madeleine to pump out calming perfume, not making it past trials at Euston, Piccadilly and St James's Park, it looks as though we will have to put up with more "people odour" this summer. However, being able to hear the music from people's iPods and the like is definitely a pet hate from mine, and I've often wondered what it does for the hearing of the "offender". The problem is they wouldn't be able to hear even hear you say "Turn down your music mate"! So do you agree with the survey, would farts, BO, loud music and snogging be amongst your personal peeves? Or do you have other pet commuting hates? It's great to see contributors to the blog being so generous with prizes for the competiton. 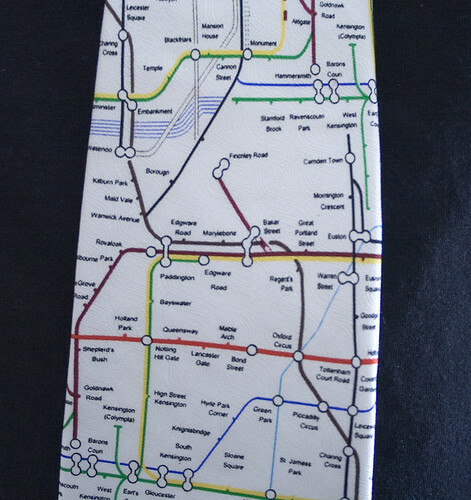 Firstly, we had Graham O'Mara with a number of books, then Fimb with last week's London Underground Anagram Map Mug quiz, (still time to enter that until Sunday 9th April) and now we have another regular contributor, Jon, who's giving away a London Underground Map Umbrella for those April showers and a set of Feng Shui candles for err, well, don't ask. Ant and Dec's alien film, Alien Autopsy, opens this weekend (to some fairly awful reviews - ah, poor Dec and Ant), so it's kind of fitting there's an alien theme to the competition. The screen grabs below are for a TV ad for Airwaves chewing gum, featuring an alien on the Tube. 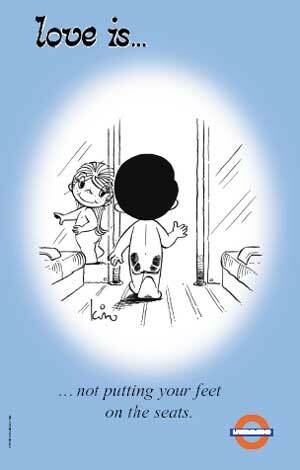 Jon says: "All you have to do is suggest captions and/or speech bubbles for the 'toon above. Submit your ideas in the comments below by Friday 14th April (leave your email address and/or website and blog too). All entries will be worked up and submitted to the people on Jon's list. The winner will be the one who gains the most votes from the people on the list and will be announced as soon as the votes are all in, probably a week later on April 21st." Easy enough. Good luck and have fun! Here's our regular Friday look at commuters who are slaves to fashion or people who are taking a "trendy" style and "making it their own" regardless of whether it suits them or not. 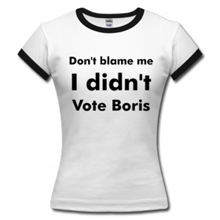 It's ladies week this week and I must admit I usually find fewer male fashion victims than female ones. 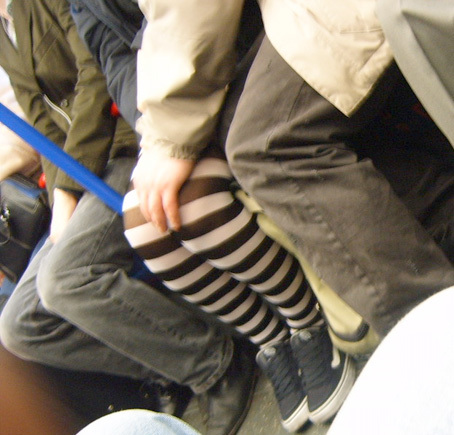 I'm not sure what sort of shoes "go" with such stripy tights. Probably nothing, but at least keeping to black and white wasn't such an assault on the eyeballs. The brown boots in the foreground are OK. The metallic boots on the left are, well, bearable I suppose. But blue metallic shoes! Jesus, what was she thinking when she bought them? I was particularly flabberghasted to see the chequered pattern on them and the black ribbon running round the edge, just to emphasise the hideousness of the blue. The shop assistant saw her coming, and thanks to that shop, now the rest of us can see her coming from a mile or so away. I promise not to go on about the fishnet tights, but purlease, black fishnets with white shoes. Fashion police where are you, when we need you? 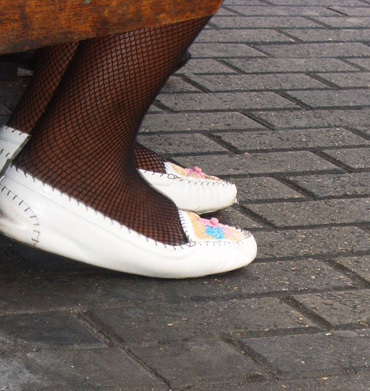 They look like a nice comfy pair too, but (ah the horror), she's wearing them with tights. This is the female equivalent of men wearing sandals with socks. 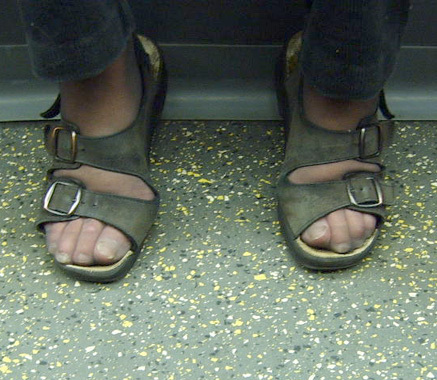 However, when you look at her elegantly cut toenails it's hardly surprising she chose to cover up her feet a bit. I'm going to sound like someone's Mum here, but why do girls go out wearing skirts that are so short they could almost be belts? I'm not sure why the girls at Waterloo station had such an obsession with red either, perhaps they wanted to draw even more attention to themselves.